What Is The Best Way To Lose Muffin Top? Is there really a best way to lose a muffin top fast? "What is the best way to lose a muffin top fast?" How many times have you seen this question on women's weight loss blogs, wellness forums, and in magazine articles? Women who carry flabby belly fat that hangs over their jeans want it gone...like three minutes ago...and it is no wonder. Not only does belly fat on women look unattractive, it is also directly connected to a variety of health issues including heart disease and Adult Onset Type II diabetes. Belly fat is the most stubborn of all fat on the body and the focus of just about every celebrity and "special" diet on the planet. Many women in the 20-32 age group are consumed with trying to find out "How can I lose my muffin top?" How has it been for you? Have you tried several different diets, but found about the only thing you lost was time...and patience with yourself? Did you actually lose a good bit of weight on certain diets, only to be overcome with cravings for high-carb/high-fat foods, and gain even more fat back? Yo-Yo dieting is one of the most humiliating experiences a woman can have in her weight loss journey. Seeing oneself as heavy and fat is a major contributing factor in depression, and Yo-Yo dieting is extremely destructive to a woman's spirit. It is no wonder so many women come online to search for the best way to lose muffin top...and want to find the quickest tactics available. Women's weight loss is a billion dollar industry, and it is full of uncaring marketers who prey on a woman's emotions to make easy fortunes. The biggest lie told is that you can lose your muffin top fast. In reality, this just doesn't happen. It took several years for you to put on excess weight, and it is going to take some time and conscious effort to eliminate belly fat. The second biggest lie told to women is that they can "exercise-off" their muffin top with the latest (and expensive) piece of home equipment or workout video. Don't get me wrong, regular and consistent exercise is definitely needed to lose belly fat, but you CANNOT "spot reduce." Doing thousands of crunches and leg lifts everyday will certainly make your abdominals stronger, but there is no way they can stimulate enough of a metabolic response to burn belly fat. These two myths, alone, are enough to keep women confused, frustrated, and desperate...and keep marketers rich. So...what is the best way to lose my muffin top? The best way to lose your muffin top is to adhere to some simple and sensible strategies for making positive changes in your food choices and eating habits. These principles come directly from the best-selling Flat Belly Solution, a premiere women's weight loss plan created by nutritionist, Isabel De Los Rios. They are not something I dreamed up. * First, get a positive mindset that you can make significant changes in your eating habits and lifestyle to lose the fat you want. * Start by eliminating ALL sugar foods from your cupboards and diet. No sugar cereals, no sugar desserts, no pop. * Start reducing the amount of starchy, high-carb/high-calorie processed foods in boxes, cans, and plastic wrap. * Begin eating more fresh vegetables and fruits...at every meal. * Begin eating a solid (NOT a "smoothie") protein source, like eggs, turkey, fish, grilled chicken at each meal. * Begin drinking more water throughout the day. * Seek to lose a progressive...and SAFE 1-2 pounds per week. 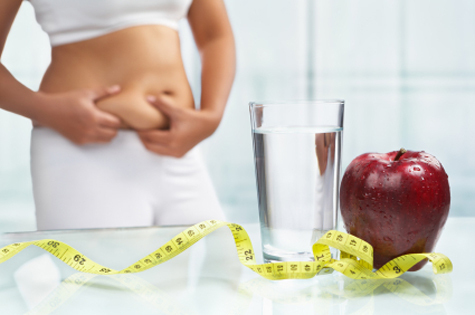 The Flat Belly Solution (also known as the "Diet Solution Program") is a proven, effective program that has been purchased by thousands of women. By following Isabel's plan, you will discover how to eat more consciously and make far better food choices. You can lose excessive belly fat by making conscious, and lifelong changes in your nutrition, and getting moderate exercise each and every day. It will take time, but you will notice a significant difference in 16-20 weeks. The best way to lose a muffin top is with a proven program that is safe and sensible.